When you have your iPhone in your hands, you are bound to stay glued it. Streaming videos, playing games, listening to songs, all are compactly available on your iPhone. However, sometimes it is hard for us to get media resources directly from our iPhone. So we may wonder “why not add videos to iPhone from somewhere”, like iTunes library or computer. Most users may consider iTunes to do so at first but find that iTunes is a good way with some restrictions. Here you can find the instructions to video transfer to iPhone without iTunes. Actually, iTunes is not a good tool to transfer files between different platforms. That’s why most user do not like it. Here are some restrictions of iTunes. Sync iTunes videos to iPhone, the existing video library on iPhone will be deleted as well. You cannot transfer videos to iPhone from more than one iTunes library/computer, and your current files may be deleted . You need to add videos from computer to iTunes library first before transfering to your iPhone. There may be many different iTunes errors and hard to get rid of those errors. iTunes is not light-weight, which occupies much storage space and CPU on your computer. 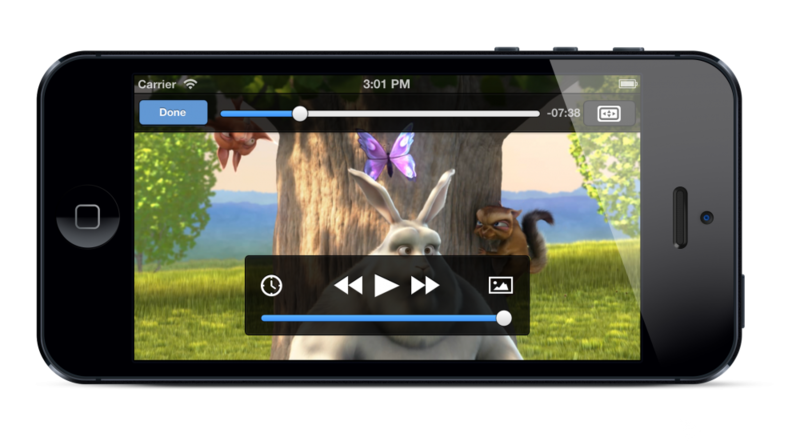 As iTunes has so many disadvantages, why not consider a better method to put videos to iPhone without iTunes. You can consider third-party iOS data transfer to do so. A more super one is iMyFone TunesMate which gives you all-in-one solution to manage or transfer iOS data easily. 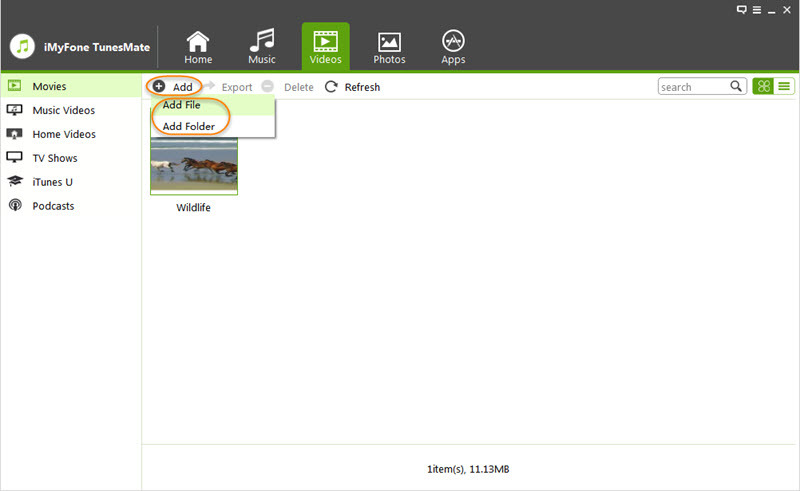 TunesMate is a user-friendly transfer ready to empower users when transferring media files of all sorts. It has appropriate options specifically complying with your video transferring needs. You can very well use this brilliant application and transfer videos to iPhone without iTunes. It fully supports iOS 12 and previous versions. Two-way transfer to sync videos freely between iPhone and computer/iTunes. Previous video library on iPhone won't be replaced when transferring, just adding files to iPhone. Transfer videos to iPhone from different computer/iTunes libraries without erasing. Share videos with friends or family, even in different Apple IDs. i. Open TunesMate on your computer and connect your iPhone. ii. Click “Videos” tab at the top and choose a specific option like “Movies”. iii. Click ‘Add’ and select ‘Add file or Add Folder’. Choose the videos from your computer for your iPhone. i. Launch TunesMate and connect your iPhone to it. ii. 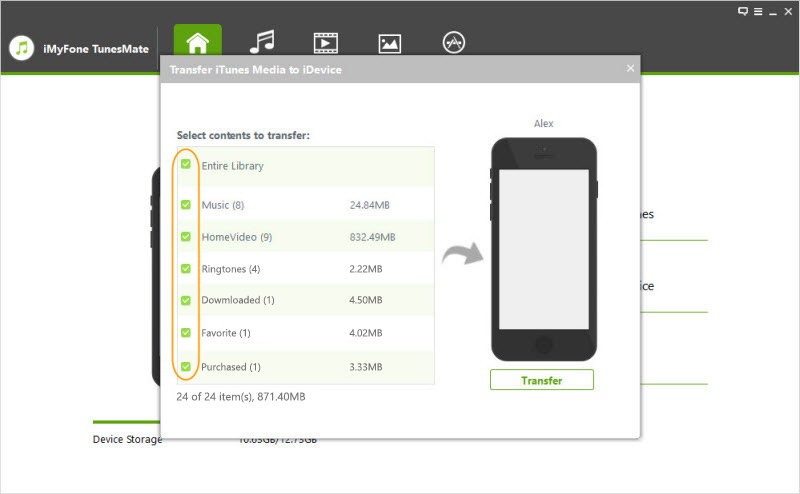 Choose “Transfer iTunes Media to iDevice” on the interface. It will detect all iTunes media and show them. iii. Select some items and click “Transfer” button to start. iMyFone TunesMate would safely transfer the files you selected. It does not create a copy with its domain. It acts as a medium of exchange. The next time you would consider transporting files to and from your iDevice you can safely trust the services of iMyFone TunesMate. TunesMate enables you to skillfully transfer videos, pictures and music files from your iPhone to PC. You can also take this chance to use this application and transfer your desired media files directly onto your iTunes library. TunesMate has a one click option. It diligently saves time and the effort. With the help of this 1-Click Transfer option you can easily transfer all your files between iOS device and computer/iTunes in one go. This connection goes two ways. You can easily tag files from your computer and with the help of this application transport it directly into your device. Besides, you can also manage your data or files on your iOS device or iTunes library easily.